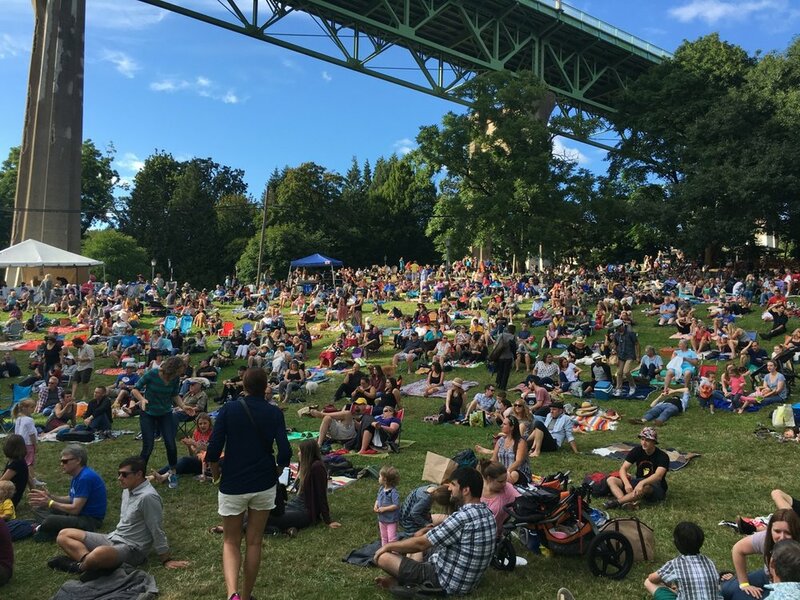 The Jazz Society’s Cathedral Park Jazz Festival is a FREE concert open to the public and held over three days in mid-July at Cathedral Park at the base of the St. Johns bridge in the Cathedral Park neighborhood of Portland. Now in its 39th year, the festival is the longest running jazz and blues festival west of the Mississippi River. The Festival is a major musical event in the heart of summer for the Portland Metro area, and features the region’s best local jazz and blues musicians. It also fosters cooperation and pride in the north Portland neighborhoods of Cathedral Park and St. Johns, and recognizes and promotes the community’s local businesses. The Festival begins Friday night with dynamic Blues, R&B, and Soul. Saturday and Sunday will feature multiple styles of Jazz in all their glory (see Performance Schedule). The stage is situated in a natural amphitheater with a backdrop of the beautiful Willamette River to the west and the mighty St Johns Bridge overhead. The lush, green, and beautifully-maintained festival grounds are the perfect place to bring a picnic or to purchase delicious offerings available from our food vendors. You are welcome to spread a blanket or set up low-profile beach chairs in the grassy bowl in front of the stage. The Jazz Society of Oregon’s Cathedral Park Jazz Festival needs helpers to provide the many services that enhance the Festival experience for all who attend—including the musicians, the audience, the sponsors and vendors. Members of the public who volunteer are friends of the Festival and to the community we serve. A one-year membership with the Jazz Society of Oregon. You will receive all membership benefits. Two complimentary beverage coupons to enjoy after your shift. Free cold water will be provided during your shift. Click this link to get to our online volunteer signup page! Note: SignUp.com does not share your email address with anyone. If you prefer not to use your email address, please contact the volunteer coordinator directly at volunteer@jazzoregon.com and we can sign you up manually. Location: On N. Crawford street between N. Pittsburg Ave. and N. Baltimore Ave. The street is adjacent to the amphitheater and blocked off for foot traffic only. Standard size: 12ft. x 12ft., maximum 10ft. height. Larger sizes available for an additional fee. Facilities: Potable water, grey water disposal, electricity. Once your application is accepted, you can pay the fee by check payable to the Jazz Society of Oregon at the address above, or you may use the PayPal button below. Payment is due within 30 days after acceptance in order to keep your reservation. However do not make your payment until you have been notified of acceptance. There are many ways to collaborate with Cathedral Park Jazz Festival. Because this Festival is FREE, we rely on sponsors to help off-set the costs of production. To become a sponsor, you may donate money or donate products and/or services. We will feature our sponsors on radio, print, internet advertising, and television. During the Festival we offer our sponsors food and drink in a special VIP hospitality tent. The Jazz Society of Oregon has promoted America’s original art form—JAZZ—for over forty years. The JSO is an all-volunteer, 501 (c) (3) non-profit organization.